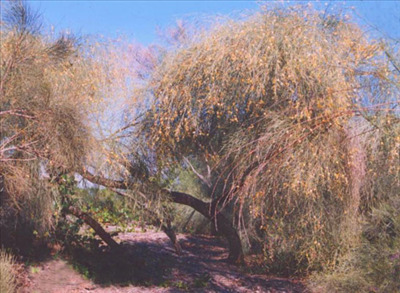 Attractive small tree or shrub with dark grey furrowed trunk, pendulous branches and long narrow leaves. 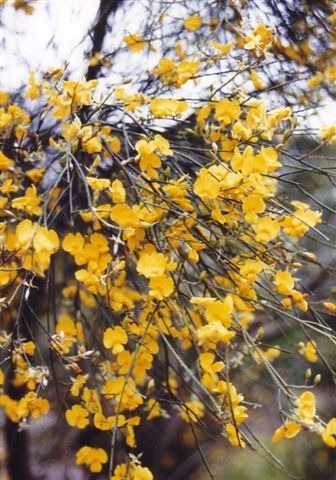 Profuse scented yellow pea flowers appear in winter-spring and attract butterflies. Tolerant of moderate-heavy frost (20-25F) and prefers well-drained soils in full sun. Tolerates extended dry or wet periods once established. Excellent landscape plant. Propagation Information: These seed need pre-treament to trigger germination. Pour boiling water over seed and let stand for 24 hours. Seed germinates in 3-12 weeks. Sow seed in mix 3:1 Perlite:Peat and cover the depth of the seed. Keep moist until germination occurs. Drench seed with a fungicide after sowing to prevent "Damping Off'.